Source: Image/Netgalley- I received this in exchange for an honest review. HINGES is a fantasy webcomic, turned graphic novel, about a doll named Orio and her troubling companion Bauble. New to the city of Cobble, Orio must depend on help where ever she can find it, but her assigned familiar Bauble has other interests. And as the two explore the walls of their city, they find that they are not the only new arrivals. In a place that runs like clockwork, it only takes a little disruption to upend a city. Hinges is a peculiar little comic with a lot of quirk and personality. Orio is a doll and is new to Cobble city, her first tasks are to find an Odd companion and then find a job. Her Odd is Bauble, who is a bit more trouble than he might be worth and seems to have a bit of an alternative motive when it comes to her. The job portion is a bit harder than it sounds to and she finds herself in quite a bit of trouble. We don’t get to know much about Orio or Bauble, but I really like them both. Orio seems incredibly shy and unsure of herself and goes most of the book without uttering a word, so when she does I couldn’t help but smile. Bauble is a bit harder to place. I can’t say I trust him, but I really like his peculiarities. 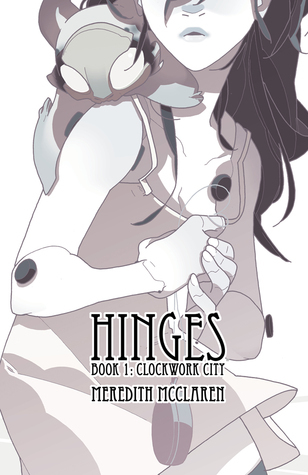 I loved the artwork involved in Hinges, it’s simple and has a cuteness to it that really stands out to me. The story is mostly told in silent panels, with very little talking done and almost all of it being done by someone other than Orio. It does leave a bit to be desired when it comes to explaining why might be going on in general, but I think overall the style of it really works for the story. 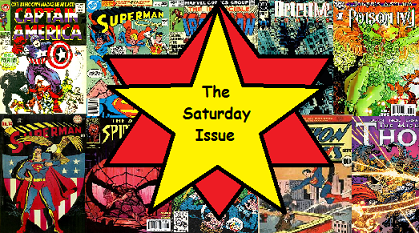 This entry was posted in Book Reviews (2015) and tagged 3.5 Stars, graphic novel, review, saturday issue. Bookmark the permalink.